Of the three-day-old he put aside. These were the people of Thebes. In “Laughing With One Eye,” an elegy for her father, and the first poem in her first book, Gjertrud Schnackenberg writes of her father’s filing cabinet, “Packed with years of writing working toward/ A metaphysics of impersonal praise” and, after reading Supernatural Love: Poems 1976-1992, which all but collects the poems from her first three books, “metaphysics of impersonal praise” seems a just way to describe the ambitions of her work as well. From the beginning, Schnackenberg’s poetics has been shot through with the historical and the moral: her intricate sometimes ornate style, her elaborate metaphors and extended sinewy syntax, her erudition, all have contributed to a sense of encompassing interconnectedness and inexorability in her work—the inexorability of fate, the interconnectedness of God and “the secret workshops/Of the silkworm”—of everything, if one only had the requisite depth of perception. In her new book length poem, The Throne of Labdacus, Schnackenberg maintains her complexity of vision while writing her most austere, and arguably most beautiful, work to date. Based on the story of Oedipus, The Throne of Labdacus is written in flexible occasionally rhymed couplets, and the couplets give the workings of Schnackenberg’s intertwined winding images room to breathe. The focus of the poem is less on Oedipus himself than on the relationship between the gods and humans, between the gods’ language and human language, between language and silence, and the “gap/Between what is done and what is seen,// What is seen and what is known.” Structured around a handful of recurring motifs such as the image of a housefly, the oracle’s “ruthless jewel,” Laius’ cart, the writing tablets of the gods, and the image of the god’s hand at the strings of his lyre “as if plucking a single fate/From a heap of entangled fates,” the poem unfolds in a deepening spiral. LH: Carol, Schnackenberg is a poet I keep hearing about but have never found my way to. Can you tell me how or when you discovered her work? CM: I discovered Schnackenberg’s work either during college or shortly afterward. The first edition of her first book, Portraits and Elegies was part of Godine’s chapbook series. I was much taken with the opening poem, “Laughing with One Eye,” an elegy to her father, and in particular the dream sections in italics. My favorite one, the most lyrical, that ends “slowly quite/Slowly you turn blindly to me the white/Featureless deep lily of your face” was left out when the poem was reprinted in Supernatural Love. But in general, I found the intricacy of her work—the technical, intellectual, and emotional subtleties—impressive and memorable. Under a bas-relief horse’s red-stained hoof? Kilometer-wide field that was once a plain. If I recall, you see the use of constraints as similar to more formal poetries. Does that also apply to your reading? Do you feel drawn to work that is similar to your own, or do you find yourself drawn to work that feels distant, challenging? CM: Characterizing my own work is something I try not to do and don’t feel particularly adept at—if I’m drawn to work like my own it’s completely subliminal. When reading, something either intrigues me or it doesn’t; I can’t always say why. I do know that I can be attracted to work that seems very free, uninhibited, straight from the source—which is probably very different from mine—even as I’m aware that the sense of freedom that work gives off is the result of hard-won art. I like to be challenged in my reading, but I suppose it depends on what you mean by challenging. I like to have some ground, however narrow or precarious, to stand on. And by that I mean I want the work to give me a way in, to pique my interest, to arm the experience of reading with a certain pleasure rather than to be akin to the punishment of Sisyphus. Formal constraints, or formal experiments, can be a great diversion for the conscious mind and can therefore release unconscious material and connections. These constraints can be metrical, but they can also involve other poetic techniques—repetition, rich sound patterns, stanza shape, the interweaving or extension of an image. When executed well, these techniques create a fabric so that a poem’s content and form are at one, inseparable, and this is of course among the delights that distinguish poetry. I don’t consider myself a formalist though and find the usual distinction between formalists and experimentalists rather shopworn. LH: You have recently published a novel, haven’t you? This is a rather predictable trajectory for a Canadian poet, but isn’t it unusual for an American poet to move to the novel form? CM: Yes, my novel The Widening was published by Etruscan Press this past spring. I don’t know how unusual a step it is for an American poet–Forrest Gander has also just come out with a short novel and I know a couple of other poets with novels-in-progress. I think a lot of novelists at one time or another wrote poetry, but that is a different story. For a moment, it looked as if American poets were all writing memoirs—perhaps there is a shift. I think there is a lot of excitement these days about the possibilities of cross-genre and it makes sense that poets, always sensitive to the impact of form, would experiment. LH: Was it a difficult leap? CM: Well, yes and no. The Widening is written in self-contained, lyrical segments, most of them under a page, and each segment is a kind of episode or moment in the character’s experience and consciousness. It takes a girl’s sexual experimentation as a vehicle for exploring her growing consciousness of self, and the book hews very closely, though not completely, to the girl’s point of view. So section by section and in regards to its interiority it is somewhat akin to poetry. In my poetic practice I’ve always been fascinated by syntax, by the relationship between the line and the sentence and the ways in which the structure of a sentence is one element controlling pace and the flow of information even as it maneuvers around, or is maneuvered by, a poem’s lines. I enjoyed letting sentences be unfettered for a change. The book as a whole is intricately woven though and constructing it was an interesting challenge. LH: Are you working on poetry again? CM: Yes, I’m working on new poems and very happy to be doing so. Poetry is my base and I certainly think I have more to explore there. I can’t imagine feeling finished with poetry, though sometimes poetry is finished with us. In 2010, Etruscan Press is going to publish a volume of my new and selected poems, So Late, So Soon. LH: You live in New Mexico, far from the madding literary crowds. Or perhaps there are crowds there too? Do you think of yourself as part of a poetry community? CM: There is a wonderful vibrant literary community in New Mexico and I very much think of myself as part of it. The poets Arthur Sze, Miriam Sagan, Mei-mei Bersenbrugge, Dana Levin, John Brandi, Renee Gregorio, Greg Glazner, Jon Davis, among others, are all very active. I find it a very supportive community. But I also think of myself as part of a far-flung community of poets: friends whose work I admire, who’ve been supportive of me and I feel supportive of, including some writers I’ve known since college, with whom I still exchange work. I’m not part of an easily defined group; it’s a very personal thing. And then, when you read a poem deeply that poem and the poet who wrote it become part of your community, whether you know the poet or not, whether the poet be living or dead. 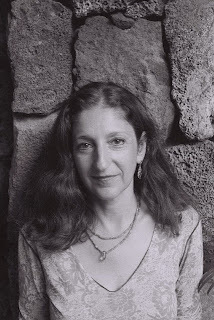 Carol Moldaw was born and raised in the San Francisco Bay Area. She holds an A.B. from Harvard University and an M.A. from Boston University, and lives in Pojoaque, New Mexico with her husband, Arthur Sze, and their daughter, Sarah. Moldaw is the author of a lyric novel, The Widening, and four books of poetry: The Lightning Field, Through the Window, Chalkmarks on Stone, and Taken from the River. A recipient of a Lannan Foundation Marfa Writer’s Residency, a Pushcart Prize, and a National Endowment of the Arts Creative Writing Fellowship, Moldaw’s work is published widely in journals, including AGNI, Antioch Review, Boston Review, Chicago Review, Conjunctions, Denver Quarterly, FIELD, The New Republic, The New Yorker, The Paris Review, Parnassus, Threepenny Review, and Triquarterly, among others, and in many anthologies, including Western Wind: An Introduction to Poetry (McGraw-Hill) and Under 35: A New Generation of American Poets (Anchor-Doubleday). Moldaw teaches at Stonecoast, the University of Southern Maine’s low-residency M.F.A. program, and has conducted residencies at the Vermont Studio Center, taught at the College of Santa Fe and in the MFA program at Naropa University.